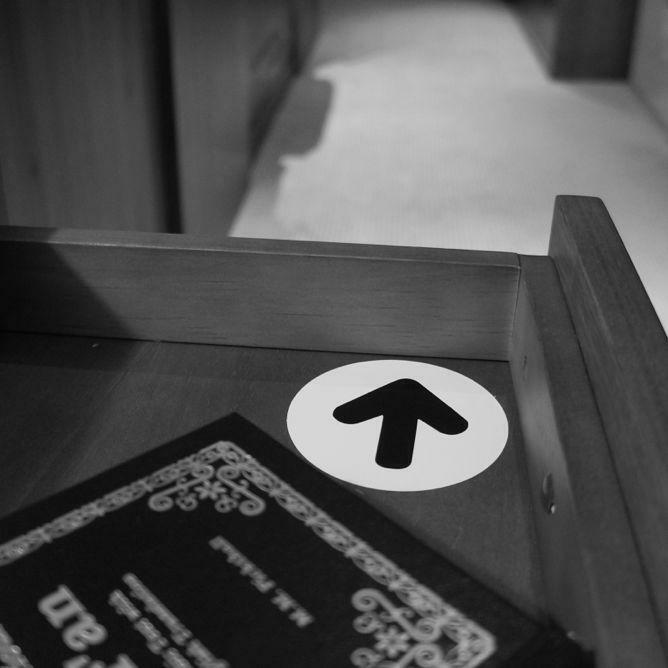 The arrow on a hotel room ceiling or desk is the Qibla, an orientation symbol for Muslim prayer. What Does That Arrow on a Hotel Room Ceiling Mean? Why is there an arrow on the ceiling of this hotel room? It’s time for another international edition of What’s That Thing, Slate’s column that examines the details of the visible world that are hiding in plain sight. Send ideas for future columns, along with a photo if possible, to whatisthat@markvr.com. The décor of the chain hotel room is as straightforward an icon of globalization as that of a Starbucks. That, of course, is the point. Although many leisure travelers prefer to rest their heads in locally tuned bed and breakfasts or Airbnb yurts, others—particularly frazzled business travelers—will take comfort in knowing that brand-name hotels consistently offer their favorite things: Internet access, an ironing board, daily cleaning, room service, a (pricy) minibar. This near-perfect standardization makes the occasional variation more interesting. For example: the arrows—on either a sticker or a plaque, on a desk, table, or ceiling—that appear in hotels rooms across a huge swath of the planet. What do they signify? Such arrows are known as Qibla pointers. They indicate the direction of Islam’s holiest site: the Kaaba, in Mecca, Saudi Arabia. Unfamiliar cities and large hotels with complicated floor plans are inherently disorienting—as anyone who has walked out of his hotel room and been unsure of where to find the elevators can attest—so the Qibla arrows help Muslim guests easily orient themselves for prayer toward Mecca. In a Dubai hotel room drawer, a copy of the Quran and an arrow pointing toward Mecca. Qibla pointers are common throughout the Islamic world and occasionally beyond. I’ve seen them in hotels from West Africa all the way to Singapore—famously multicultural and next door to Muslim-majority Indonesia and Malaysia. In my experience, the stickers are typically green—a color associated with Islam—or black. Sometimes there’s text as well, but often the arrow stands alone. 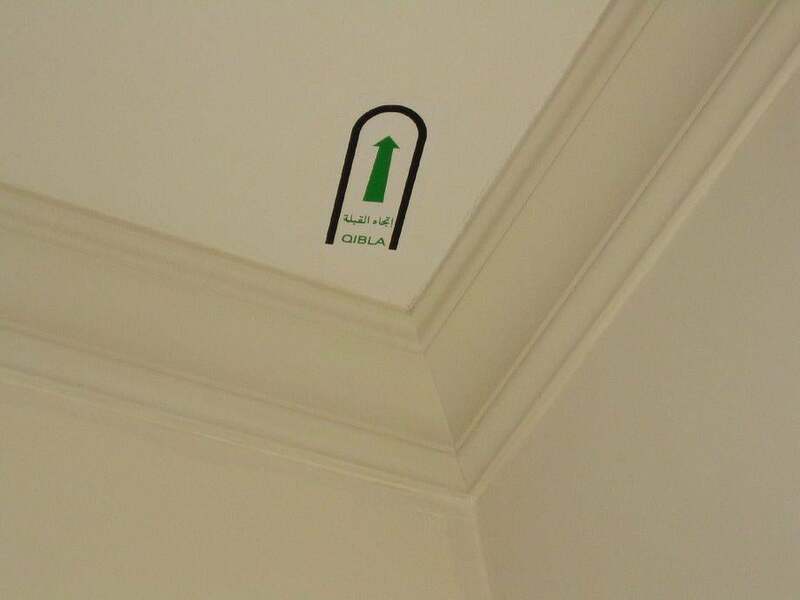 In some countries, such as Saudi Arabia, Qibla pointers are mandatory, according to Basel Talal, general manager and district director of the Rezidor Hotel Group there. Qibla pointers can also be found in airport prayer rooms and quiet areas around the world. Before a hotel opens, staff calculate the direction to Mecca by going room by room with a compass or, increasingly, with a Qibla-finding smartphone app. How do hotels decide where to place Qibla pointers? Deema Kingsmill-Moore, a spokeswoman for Marriott, says hotel chains account for several factors, including the nearby floor space available for prayer. Talal says a hotel shouldn’t place a Qibla pointer in a drawer or on a desk, as it could be covered by a traveler’s belongings. “A ceiling location and close by the entrance, to be easily spotted after entering the room,” he notes, is best. 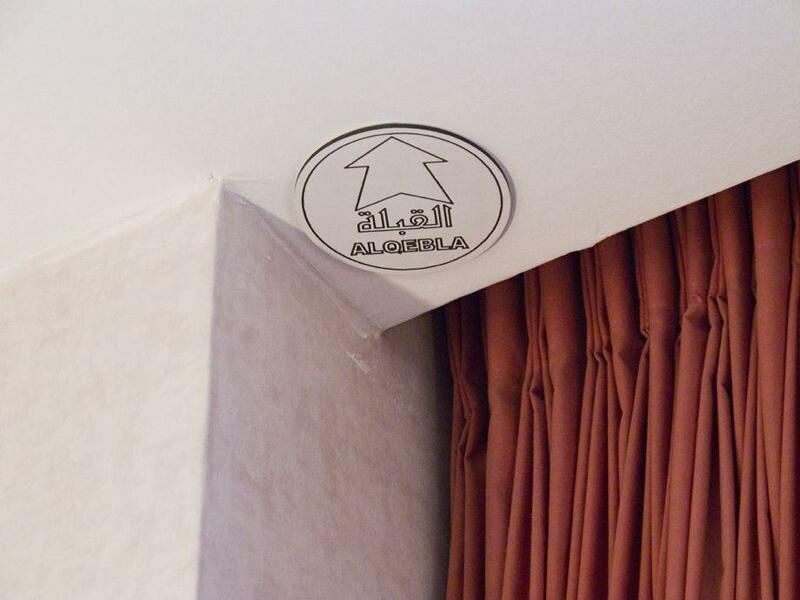 A Qibla compass on the ceiling of a hotel room in Amman, Jordan. The pointers also have symbolic value. Even for non-Muslims, there’s a certain poetry to the idea of so many arrows scattered so far across the world, all turned toward a city with a name so famous that it’s become a synonym for any dreamed-of destination. And as Ibrahim Hooper, a spokesman for the Council on American-Islamic Relations, told me, Qibla pointers can help indicate that Muslims “are accepted and welcomed” in hotel rooms far from home. For that reason, they’ll likely survive in an age when travelers can turn to their smartphones to find the direction of Mecca—and everything else. See something around your hotel room or anywhere else that you’re wondering about? Send a pic and description to whatisthat@markvr.com.